RyanAir has increased the number of low cost flights to the Girona/Barcelona (GRO) airport for the summer of 2017. The Barcelona airport (BCN) is just an hour south of Girona airport so flying into the Girona airport cuts an hour off your driving time, as most of the 25 villas we offer in our website are within 10 to 35 minutes drive from the Girona airport. Car rental is also very affordable in the area, starting well under €25 per day. 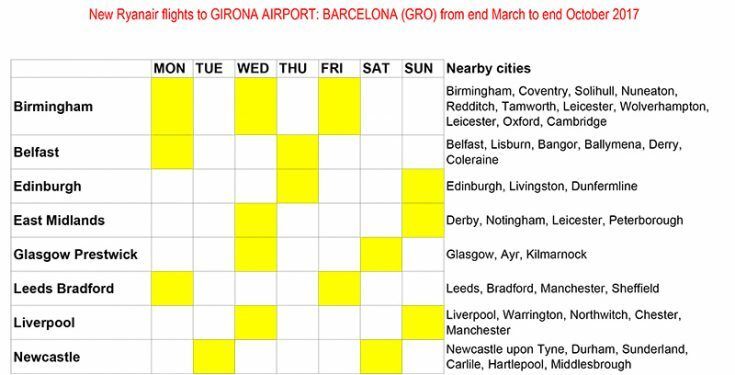 Based on the information provided by RyanAir we've worked up a schedule of flights and the cities in UK and Ireland now reconnected to the Girona airport.